When UFC Undisputed landed with its first installment in 2009 I remember thinking to myself “this is the best game EVER”. As the novelty of having a MMA game slowly wore off the deficiencies in the game began to emerge and the honeymoon came to an end. In the face of renewed competition from an upcoming MMA title from EA, UFC Undisputed 2010 genuinely attempts to improve on its strengths and rectify the flaws from the previous version, with varying degrees of success. 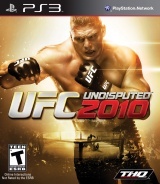 To cut a long story short, UFC Undisputed 2010 is a far better game than its predecessor, but it’s by no means perfect. 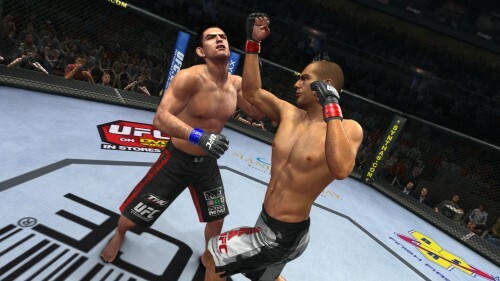 The visuals in UFC 2010 have been ramped up to a new level from those in the original version. While there are still some fighters that look much better than others, by and large the fighters are immediately recognisable as their real life counterparts. A negative though is the rendering of some of the referees and legendary announcer Bruce Buffer, both of which suffer from being far less detailed. Honestly THQ, would it have taken THAT much longer to get another half-a-dozen characters up the highest level? For me it really detracts from the overall presentation when you see an almost photorealistic character like Quinton Jackson standing next to a cartoonish Bruce Buffer. Most of the action of course occurs inside the Octagon, and there’s nothing to complain about there. Whether it’s pristine to start a match or covered in blood at the end, the Octagon stands up! The movement of the characters in UFC 2010 feels more fluid and realistic this time around, and it’s impressive to see the amazing amount of attention to detail that has been paid to the styles and moves of each fighter. Even unorthodox fighters like Jon Jones fight in their immediately identifiable style, and it provides a true reason to use more than one fighter. Veterans of UFC 2009 will be able to jump straight back into the action and pick things up where they left off, as the control system is mostly the same as the original version of the game. 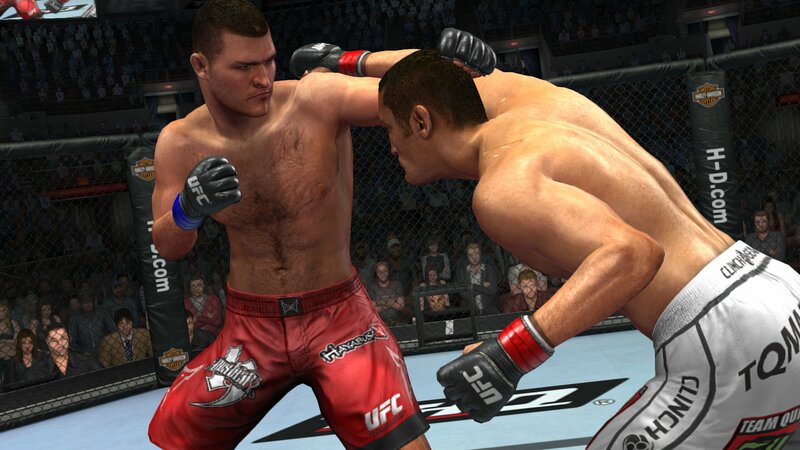 UFC 2010 adds some new twists though with the addition “swaying” to avoid incoming strikes, and also allowing fighters to use some moves specific to an “against the cage” scenario. It all adds up to make the combat experience more realistic this time around. The Create A Fighter (CAF) mode has been expanded and refined this time around, but I still find it to be an overall boring mode to play for any length of time. The process begins when you create your fighter, and there are many more options for customisation in UFC 2010. Once you’ve specified your fighter’s physical appearance, fighting style and general stats you then begin your career as an amateur. During this time you can gauge your abilities against fighters of varying difficulty levels, and once you get a feel for your skill level you can then move forward at that level. When you choose to turn pro you begin your career in the fictitious WFA (why they didn’t use the UFC-owned WEC organisation I don’t know), and if you’re successful it won’t be too long before Dana White comes calling to sign you up in the big leagues, the UFC itself. This early creation process is quite fun, and so is the early part of working your way up through the ranks. It is definitely a buzz to finally get into the UFC and begin the climb to the title shot. What follows is an incredibly repetitive and unexciting juggling act that happens leading up to each fight. You train your core attributes, you train your techniques, you visit fight camps to learn new techniques. You spend a lot of time making appearances on television shows and UFC cards to boost your fighter’s profile. All of this is great the first time around, but when you are doing it for fight after fight after fight it really does get boring. The other downside is the constant juggling of your fighter’s stats. Between fights you’ll notice things decaying, and it is a nightmare sometimes to keep your fighter’s stats stable in the areas you value most. I am all for realism, but surely a 23 year old fighter is not going to forget how to throw a kick over a period of 11 weeks like he has Alzheimer’s disease! It takes a good concept WAY too far and turns your fighter into the lead character from ‘Memento’. The fights themselves are great, and it really is satisfying to knock out guys you’ve watched on pay per view for years! I do find however that the title fights are of a much higher difficulty than anything leading up to them. Case in point: I blasted through every heavyweight contender with Brock Lesnar, finishing all of my leadup fights in under a minute…. until I came to the title fight, when Frank Mir took me down as his FIRST MOVE and then submitted me with his SECOND! I had taken zero damage, and the match was barely 20 seconds old! That leads me nicely into talking about what is probably the biggest negative in the game – submissions. The submission system this year has been updated, and although you initiate a submission the same way, to lock it in and force your opponent to tap requires the use of a technique THQ call “the Shine”. Shining (on PS3) involves you rapidly rotating your right analog stick with the palm of your hand. It’s the button mash of the new generation. Look around online and you’ll see tips on how to get a “clean shine”, because apparently speed is good, but accuracy (hitting the points on the rotation) is better. With practise, shining becomes easy, if only that was all if took to submit someone. I’ve used fighters like Demian Maia who are BJJ GODS against people who have no ground skills whatsoever, and it still took a massive effort to make them tap. Often it becomes a matter of beating your opponent around the midsection (not the head, you don’t want to knock them out!) so badly that you can knock them down with a body punch and lock on an armbar. Even then you’re not a sure thing. Technique aside, the AI involved in submitting someone (and defending yourself against a submission) is WAY off and needs to be toned down a bit. Especially when you consider that you can charge across the Octagon and knock Cro Cop out with three punches using Brock Lesnar. When it comes to online, there’s a lot of new features that sound amazing on paper, such as getting your friends together to start your own fight camp. These features are cool, but when it comes to just getting on and playing a ranked match, the game fails to deliver again. I can’t speak for the Xbox 360 experience, but on PS3 it can be so difficult to connect to a match that it has turned me off from the whole experience. THQ released a patch with a few fixes, and online was meant to be one of them. In my experience though, the online is better, but not “fixed”. The team seem to be committed to getting it right though, so hopefully future patches can make the experience worthwhile. In conclusion, UFC Undisputed 2010 is a great, if flawed experience. The roster of fighters available is incredible, and the single player modes have enough depth to keep you going for a very long time – if the lack of stable online and the overly-complex submission system doesn’t have you throwing the disk out of the window! If you’re a massive UFC fan like me and are happy to play through single player or with some friends, then the game is great, a solid 7 out of 10, but if you are a die-hard online gamer who places a lot of weight on being able to flex your muscles on a global leaderboard, then at this stage I could only give the game a maximum of 6 out of 10. I have great hopes that a future patch will make the current issues disappear, and when that day comes you can add another point to the total.